If you want to export a component of a guide, a page, topic, or customization, click on the gear icon on the object in the authoring canvas. Click on export and your object will be exported and downloaded to your computer. 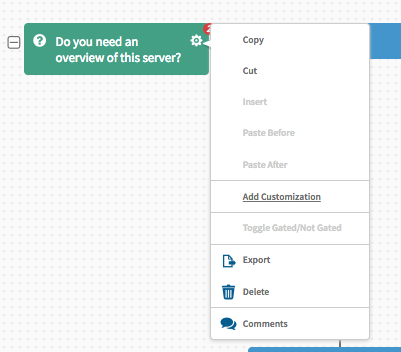 To import a component of a guide, navigate to the authoring canvas. In the top left, there is an icon that’s three stacked horizontal lines, a hamburger icon. Click on that, select import, and choose your object. Your object will be inserted into the end of the guide.